Working with Little Cloud Collective to organize and facilitate a two-day workshop introducing user-centered design to students from Women In Technology Uganda. Workshop participants create a storyboard to explore a concept about accessing health services through a mobile phone. 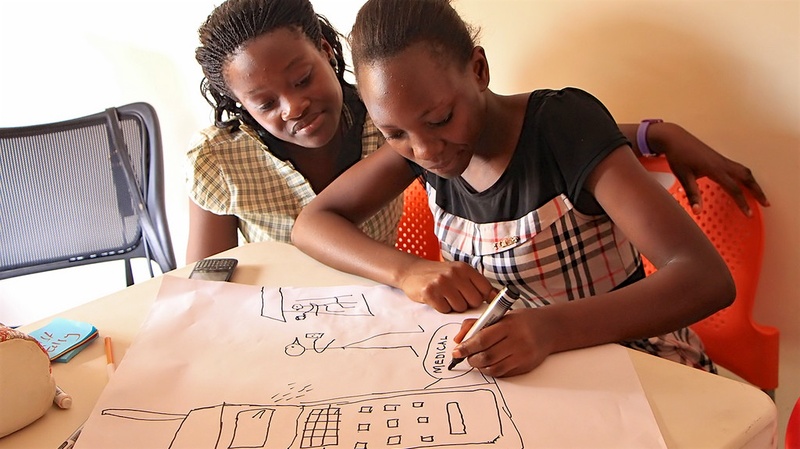 Little Cloud Collective organized Urban Collab Lab, a two-day workshop where 25 participants from Women In Technology Uganda, KampaBits and Makere University came together to envision technology-driven solutions that addressed challenges faced by young women living in Kampala. Participants gained training in user-centered design while prototyping new concepts that explored issues related to health, safety, and media. Scenes from the two day workshop. The workshop was held at Women in Technology Uganda. WITU empowers young women to build an identity in technology and business by offering a supportive environment for young women to dream, imagine, build and grow enterprises, gain employability skills and become community leaders. The workshop was sponsored by Hive Colab, a community owned innovation hub and collaborative co-working space for Uganda’s technology community. It is an open space with a focus on young tech entrepreneurs, web and mobile app developers, designers, investors, VCs and donors. The workshop invited speakers and mentors to help participants explore the workshops three topics (health, safety and media). They came from local organizations including Straight Talk Foundation, Bayimba Cultural Foundation and Kabarole Research Institute.